The Parliamentary Acts permitting the development of the Brampton Branch Line of the rail network, envisaged the development of a complementary Tramway. The rail lines were primarily aimed at freight traffic, while passengers would be accommodated on the proposed trams. 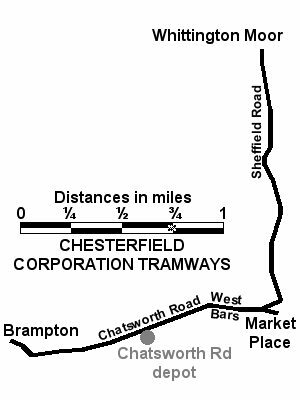 The Chesterfield and District Tramway Company was founded in 1879 and began horse tram services in 1882. The line ran from Walton Lane to Low Pavement. The operation was not an overwhelming commercial success but did manage to operate until 1897 when the company was bought by the Chesterfield Corporation. The Corporation continued operating the horse trams and gradually extended the fleet to 8 vehicles as the service became more successful. They also began planning for an extened electrified tramway. Robert Acland, the Borough Electrical Engineer oversaw the project to extend the network North to Whittington Moor and West to the Borough boundary in Brampton. Track laying work began in August 1904 and was completed in only a few weeks. A new depot and tram shed was also constructed on Chatsworth Rd. The new electric tram service opened in December 1904, using 12 new trams over the extended routes. The tramway was evidently popular with it’s users and by the outbreak of war in 1914 the fleet had been extended to 17 trams. Running costs, combined with the need for major renewals to the track meant that by the mid 1920’s, alternatives were being considered. And in 1927 the trams were finally withdrawn from service, to be replaced by an electric trolley bus service which continued to use the overhead power lines but no longer required tracks. Brilliant Martin. I love your work. Thank you. Thank you Dena. Your thoughts are much appreciated.